Have an iPhone? Expect tax refund this year? Now you can check status of your refund on smartphone, thanks to the new iPhone and Android Apps released by the IRS today as the 2011 tax season is in full swing. The free app, called IRS2Go, is available in Apple App Store for iPhone, iPod, and iPad users and in Android Marketplace for Android phone users. With IRS2Go, taxpayers are able to get their refund status on their phones by providing some basic information, such as Social Security number, filing status on their tax return, and the amount of the refund they expect from their 2010 tax return. These information is exactly the same as those you need to provide when checking tax refund status online. To ensure the security of your personal information, your SSN is masked and encrypted. If you have e-filed or will e-file your turn, the refund status information will be available within about 72 hours after receiving an e-mail acknowledgement from the IRS saying your tax return has been received. If you have paper tax returns, you will likely to have to wait three to four weeks before checking your refund status. 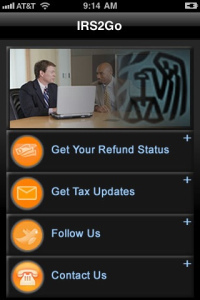 In addition to refund status, you can also receive other IRS updates with IRS2Go. That’s an awesome idea! Definitely makes it a little less anxious to know what your status is. It is. However, since I don’t expect a refund, I am not that excited Nonetheless, it’s good to see even the IRS is trying to catch up with the latest technology. I don’t have anything to track just yet since I haven’t filed yet … still waiting on a w2, but I definitely need to take advantage of this!